Did January feel really long to anyone else? December flew by, but January crawled. Unusually cold weather, unusually snowy commutes, and exceptionally smoggy days made it seem like the month would never end. Thankfully we're at February and although Mother Nature doesn't know the calendar has changed, I'm hoping the coming month will go much smoother. One thing that gives my comfort is that Valentine's Day is smack in the middle of the month, so if any of January's problems (snow, cold, etc.) return, it will be much easier to drown my sorrows in chocolate. Lots and lots of chocolate. It's everywhere this month, and I love it. Whether you need a recipe to share with a loved one on the 14th or need something to take your mind off the horrible commute you just had, do yourself a favor and make these sometime chocolate cheesecake cups soon. They are incredible. Rich, warm, chocolaty, with a nice cheesecake tang - what more could you ask for? And they are sheer genius, too, because if you've ever taken the time to make a cheesecake from scratch, you know it is not something you make for instant gratification. Waiting for the cheesecake to chill in the fridge is my least favorite part of making one. With the cheesecake portioned in cups like this you eat it when it is still warm and it has a great, silky texture and more intense chocolate flavor. 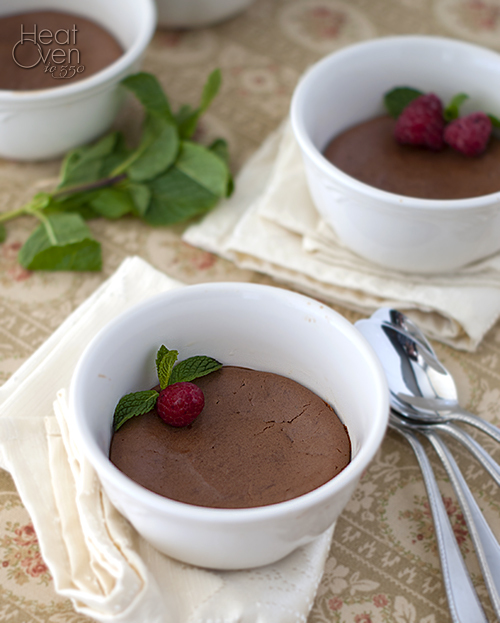 Think of them as a rich, smooth, thick chocolate pudding. If you are a cheesecake traditionalist, like my husband, you can always refrigerate your portion and it will be delicious as well. If you can't wait to get your hands on that chocolaty smoothness though, I suggest eating yours warm and topped with raspberries or whipped cream. And maybe every single night this week. 8 oz regular or reduced fat (not fat free) cream cheese at room temp. Coarsely chop the chocolate and melt it in a double boiler or the microwave on a very low power. Combine the chocolate with cream cheese in a food processor using the chopping blade. Process until very well blended. Stir together the sugar and flour and add it to the food processor. Process for a few seconds, add egg and pulse until the mixture is smooth. Divide the mixture evenly among the baking cups and bake for 20 to 25 minutes or until the centers are set. Transfer to a wire rack and let cool slightly before serving. I love that these are so easy and yet make such an elegant presentation! Perfect for my Valentine. Thanks for sharing! Bring on the chocolate - these would definitely make me feel better about the cold, snowy February nights I'm sure are ahead! oh my...these look wonderful. And quick and easy too...love that! these have my name written all over them! I am SO glad January is over with. I can't wait for springtime! Oh, pshaw. :) I'm glad it solves your dilemma. I made it with the lower fat cream cheese, too, and it was still very rich and delicious. Of course, eating two servings of it probably wasn't too healthy. . . 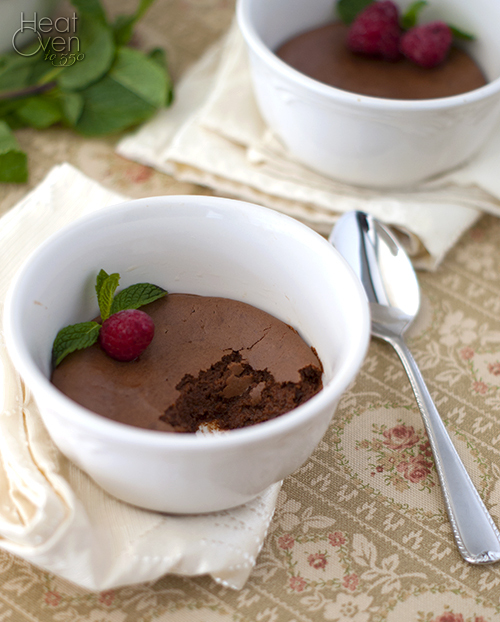 The chocolate cheesecake cups look amazing!